If you have trouble viewing this email, click here. 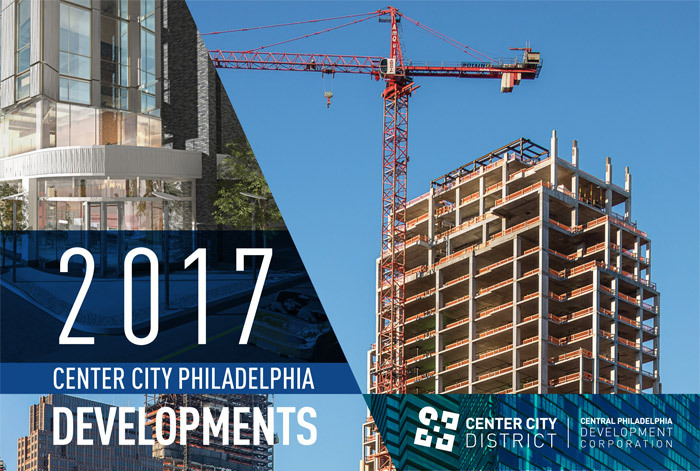 As a special supplement to the annual State of Center City report, Central Philadelphia Development Corporation (CPDC)/Center City District (CCD) has released Center City Philadelphia Developments: 2017, an in-depth report on current and upcoming major projects in Center City. Seventeen major development projects, totaling $808 million, were completed in 2016 between Fairmount and Washington Avenues, river to river. Another 42 projects of all types, totaling $5.4 billion in new investment were under construction at the end of December 2016, while 22 more, totaling $3.3 billion, have been proposed and are in the conceptual phases of pre-construction. This report includes a map and full-color photos or renderings and project descriptions of all 81 major developments in Center City Philadelphia, categorized by type. The report highlights major projects that were completed in 2016, were under construction, or had been announced as of the end of Q4 2016. Information on the various projects comes from published reports and Civic Design Review applications and entries were verified with the developers and/or architects of the projects. All data reflect project status, design, and information available to the public as of the end of Q4 2016. To view or download the report, visit CenterCityPhila.org/developments/. For a full selection of Center City District reports, visit CenterCityPhila.org/research-reports. If you would like to sign up for email updates about future CCD publications, click here.